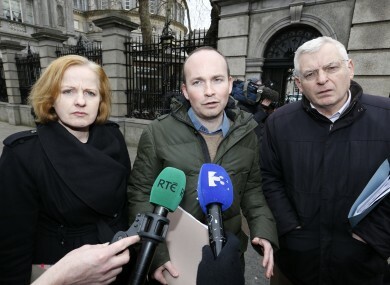 AAA/Socialist Party TDs Ruth Coppinger, Paul Murphy and Joe Higgins. THE ANTI-AUSTERITY ALLIANCE is in talks with People Before Profit to form a new political grouping. Questions were asked about the future of the AAA when a proposal to cancel its registration in the register of political parties appeared in Iris Oifigiúil, the official government gazette, yesterday. Speaking to TheJournal.ie today, AAA/Socialist Party TD Ruth Coppinger told us the alliance has temporarily removed its name from the register while discussions with PBP continue. The AAA will of course continue to operate and is in fact growing in numbers, activity and influence, particularly in the context of the vital role we are playing in building mass non-payment of the water charges and in resisting austerity itself. “The withdrawal of our listing with the registrar for a few short weeks is to continue an exploration with PBP toward the formation of an alliance for the next general election and an enhancement of the left voice in the the next Dail and to go through the necessary procedures regarding the Register to give this effect,” Coppinger said. She added that the party won’t be making any further comment on the issue unless discussions are successfully concluded. The Dublin West TD said this is “likely to be well into September”. Read: What is the Socialist alternative to Irish Water and water charges? Email “Could we be about to get ANOTHER new political group?”. Feedback on “Could we be about to get ANOTHER new political group?”.